Recipes Cooking Chicken Teriyaki Japanese Ala .Chicken teriyaki chicken is cooking meat with teriyaki seasoning. This concoction is a unique culinary cuisine cherry country, Japan with a delicious dish taste special. Many restaurants and restaurants that have been present teriyaki chicken dishes in the dish special menu list. Presenting the teriyaki chicken dishes at the family dinner table will certainly revive your appetite and your family. Step presentation is fairly easy and definitely will not bother because there is now packaged instant seasoning teriyak living used without having to bother to create one first. 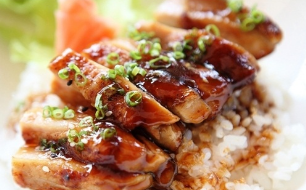 Recipe how to cook Japanese-style chicken teriyaki more you can see in the following review. The chicken thigh that has been separated from the bone and then washed and ditirskan. Then the chicken thigh meat sliced ​​and mixed with teriyaki seasoning in packaging that is ready to use. Mix evenly and allow up to 10 minutes in length so that the marinade to seep into the meat. Meanwhile, cook the chopped onion, grated ginger and garlic bruised by way sauteed with 2 tablespoons hot frying oil. Stir and cook until smelled delicious. Take slices of chicken thigh meat that has been mixed with teriyaki seasoning and then pour into a food seasoning, stir well and cook until the texture becomes thick and overcooked. Remove and serve while warm. Serves teriyaki chicken dishes typical of Japanese cuisine can also be accompanied by a fresh salad like shredded cabbage and carrots with a splash of gravy thousand islands, it would taste better again. 0 Komentar Untuk "Recipes Cooking Chicken Teriyaki Japanese Ala"